In this article we will address the causes of traumatic brain injury in car accidents, who should be held responsible, and how you can get the needed treatment paid for if the accident was not your fault. The sad reality is that over half of reported traumatic brain injuries are directly attributed to an automobile accident. A traumatic brain injury can occur when you are struck on the head with enough force that the skull is fractured or penetrated. For example, you can be struck on the head by the steering wheel or windshield, and that collision can cause lifelong injury. Even though there may not be an open wound on your head from the impact, the injury that is not visible is typically the most severe. In automobile accidents, it is not necessary for the skull to have been penetrated or fractured to a traumatic brain injury to occur. That’s because the sheer force of a car accident can cause the brain to slam against the hard bone of the skull. During a collision, the car might stop quickly when it is hit by another car, but your body and your head are likely to keep moving. Just like your head and body are eventually forced to stop by striking a part of your car, your brain will also continue traveling until it hits the skull. Even if your head hits an airbag at a significant speed, the additional cushion of the airbag can sometimes not be enough to prevent traumatic brain injury. Who Is Responsible for the Traumatic Brain Injury? When an individual is in a car accident and there is traumatic brain injury, spinal cord injury, or any other type of serious injury where the individuals inside the car have medical conditions that affect their way of life now and into the future, there are some factors that should be evaluated to determine who should be held responsible. Determining who was at fault in a car accident is also known as “determining liability.” Determining liability is not always the most simple calculation (see “Comparative Negligence in Nevada” for more information). However, there are times when liability is clear. For example, when the other driver was breaking traffic laws or in most cases when the driver hits the injured person from behind. Crashworthiness is a term that is used in the car manufacturing space to determine who structurally sound a vehicle is when it is in a car accident. The crashworthiness of a vehicle is typically determined by the car crash tests. If a car has a less crashworthy rating, and the car’s crashworthiness was a contributing factor to the traumatic brain injury, then the manufacturer of the car can also potentially be held liable for the injury. If you or a loved one is suffering from traumatic brain injury and the accident was not your fault, you have the opportunity to have the responsible party pay for the ongoing treatment. If you hire a Las Vegas personal injury attorney, all current and future medical costs can possibly be covered by the responsible party. You should not have to bear the burden of such expensive treatment if someone else was at fault. You will want to contact a Las Vegas personal injury attorney who is experienced and who understands your needs. 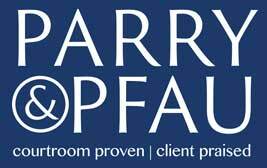 The lawyers at Parry & Pfau are aggressive and ready to go to battle for you or your loved ones. Every day we fight for our client’s rights against reckless and negligent drivers and we can fight for you too. If you would like to speak with us you can call 702-879-9555 to schedule a free consultation or you can click here to request a meeting time.